I’ve been here so many times, I’ve lost track. It’s one of my favorite places in the world. The second you step off your flight, the heat hits you, but it feels good. It warms your bones after being in “Lima la Gris.” The humidity is so intense that you can almost see it, but it’s refreshing. It’s the Amazon. It’s Iquitos, Peru. As you enter the baggage claim, you are kindly greeted by your tour guide, eager to welcome you to the destination. This time I travelled aboard the Aria Amazon Cruise by Aqua Expeditions. The service begins with a short drive and five-minute boat ride to Al Frio y Al Fuego, (this lunch is not always included in the itinerary, please check with your travel specialist), a floating restaurant situated on the Itaya River just beyond the bustling city of Iquitos. Once inside, the rustic, wooden decor make one feel in the jungle. You can smell the wood of the Anacaspi tree, and enjoy the shade of its elegantly thatched and sewn roof made of palm leaves. You can sit pool-side, at the bar, or on the second level enjoying incredible views of the city. After sitting down and reintroducing ourselves, we enjoyed the flavors of the Amazon infused in each carefully created dish. It was a delicious blend of traditional Peruvian food with a gourmet twist. To resume; wonderful staff, and the food was excellent. We were well taken care of, and the prices were low compared to the quality of the cuisine. I highly recommend Al Frio y Al Fuego whether it's your last day in Peru, or just out for a nice lunch or dinner. It's arguably the best place to eat in Iquitos. We headed out to the Embarkation Port where we would rendezvous with the ship, the 45 meter (147 foot) long Aria was designed by the innovative Peruvian architect Jordi Puig. This prominent, black-hulled ship accommodates a maximum of 32 guests in 16 cabins, plus 31 crew, including a paramedic and four English-speaking naturalist guides. Both our guides George and Juan Luis have a reputation that precedes them. They are experienced guides, well-known in the area as specialists in wildlife, and their English is one notch off native level. We were escorted to our rooms and invited to join everyone upstairs for a mandatory security briefing in 30 minutes time. Meanwhile, I start inspecting my new digs for the next 4 days, peeking in every corner to see how things work, and what I might need. 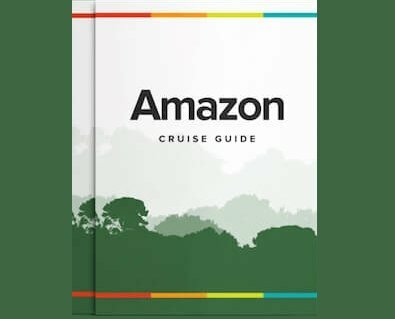 The room is outfitted with everything required for a luxury cruise in the Amazon. No need to bulk up your baggage when traveling to Peru, as Aqua Expeditions provides Shampoo, Conditioner, Shower Gel, Body Lotion and of course Soap. In the bathroom, you have one of those magnifying mirrors you always regret looking into, but incredibly useful. A hairdryer is provided on board, and in case you feel like dolling up one night they provide on a loaner basis a curling iron! The number one question for clients is “How does the air conditioning work?” As I began to ask myself the question too, I hear a knock at the door and to my surprise it’s the Cruise Director ready to answer any question I may have and make sure I knew how everything worked including my personal safe. Fast-forward to the Orientation and Security Briefing, we were carefully instructed what to do in case of emergency, and the key players are introduced. Our Cruise Director, Guides, Paramedic, Captain, and on- board Massage Therapist. I’m not sure what it is, but being in the fresh clean air of the Amazon makes you feel more alive. I heard somewhere that the Amazon Rainforest acts as the lungs of the world. Before heading to dinner. We receive detailed explanations of how things work on board, and brief description of what we could expect over the next few days. Breakfast and Lunch are served buffet style, and dinner is always a four Course Meal. Aboard the Aria, we are lucky to have none other than Pedro Miguel Schaffino as the creator of the menu and ongoing consultant for food and beverage on board the Peruvian river cruise. Pedro Miguel is a well-known Peruvian chef who has worked to highlight the foods of the Amazon jungle and Amazonian cuisine. Schiaffino owns two restaurants in Lima; Malabar and Amaz. Unlike chefs in the older days, they are not only great with a knife but chefs like Pedro Miguel are artists, researchers, and ambassadors for the cuisine they represent. I have to say that one of the highlights of this cruise is the impeccable and always satisfying cuisine. I enjoyed it very much. Whenever I am exposed to a chef of this caliber I try to recreate the dishes at home. I fail immensely, but I have great time trying. Aqua Expeditions currently has a winery that bottles wine specifically for the Aria. They offer two versions of red and white, free of charge during meals. Thanks to my barman, I enjoyed a daily “maridraje” or wine tasting with every meal. Also featured is the gin of the Amazonian Gin Company. A 100 % natural distilled ultra-premium gin. Made with 100% fresh amazonian botanicals grown and harvested by small local producers. A treat for gin lovers and those hipsters following the latest trends. Activities were bright and early. Getting up early in the Amazon is important, as wildlife is most active at this time of day. We have two main Amazon excursions daily, and an activity on board to complement. Our first day was a visit to a community, where we could do a mini jungle walk visiting the local school. Upon arrival to Las Palmas we were directed to a tree close by where we observed two three-toed sloths relaxing in the treetops. We were shown the inside of a local home where two ladies of the village were preparing lunch, the children in the community gave us a tour of their school and did a small presentation and we headed back to the ship. Guests gifted items they had brought to share with the community such as school supplies. We return to the vessel to refresh and have lunch. Naturally, after a lunch as special as those on board, many enjoy a siesta. What is absolutely wonderful is that Aqua provides you with ON DEMAND movies on your IPAD. For guests like me who have no space to save movies etc. this was a God send. One can enjoy a variety of movies, new and old. I was in heaven and soon in dreamland for a nice afternoon nap. In the afternoon, we headed back out to do some skiff exploration in the nearby Yanayacu Pucate. We were able to spot some monkeys seen in the Amazon and several birds. The Peruvian Amazon has several animals endemic to the area, such as the famous pink river dolphins and the harpy eagle. Peru has some of the greatest biodiversity in the world because of the presence of the Andes and Amazon Rainforest. Peru is the second country in terms of number of bird species in the world, making birding in the Amazon Rainforest a favorite activity. Peru is third in terms of the ever charismatic mammals such as of monkeys, jaguar, pumas, tapirs and the spectacled bear– another trademark of the Amazon rainforest. The Amazon River is home to impressive fishes like the Paiche, which can grow to three meters! Fishing in the Amazon Rainforest is an exciting activity! There are reptiles such as turtles, alligators, crocodiles and many snakes, including the anaconda, the largest snake in the world, that like to feature themselves at night. Undoubtedly, there is no other ecosystem in the world with so many species of exotic birds, among these are macaws, toucans, and the highly sought after hoatzin - critical to any birdwatchers checklist. Overall, the wildlife experience on the Aria is topped off with luxury touches everywhere. On one occasion we seemed to be out on excursion about an hour into the activity and you start enjoying the colorful greens of scenery and background, the colors of the sun fading into the sunset, and after taking very 'Instagram-ish' photos on my cell, I turn around and was served a Mimosa. It was perfect. A snack of mixed nuts and fruits tenderly wrapped in a banana bijao leaf was the perfect touch to enjoy a sundowner in the forest of mirrors in the Pacaya Samiria National Reserve. I won't spoil all the surprises in store for you aboard Aria with Aqua Expeditions, but I will say that you will not be disappointed. The polished, professional and friendly staff are always willing to go the extra mile to make you feel at home in your floating hotel. I enjoyed every minute of it, and hope I get the chance to see other destinations they offer in the future such as the Aqua Mekong Cruise in Southeast Asia. This Expert Review was written by Rainforest Cruises travel specialist, Vanessa. For more information about the Aria Amazon Cruise, please contact us or call 1-888-215-3555.